Six polling booths in Dhinkia gram panchayat, the site of the proposed POSCO steel plant, which falls under Earasama- Balikuda Assembly segment in Odisha's Jagatsinghpur district, recorded one of the highest polling turnout in the state Assembly election—92 per cent—on Thursday. No other polling station in the district recorded such high polling. The other two gram panchayats affected by the project, Nuagaon and Gadakujang, recorded around 85 per cent polling. First timers and women voters were the more enthusiastic to cast their votes, said S K Mallick, district collector of Jagatsinghpur on Monday. Protesters had barricaded all the entry points to Dhinkia to prevent the entry of any official to acquire their land for the steel plant project in 2008. For this reason, authorities had set up polling booths outside the Dhinkia during the 2009 election; no election was held for the post of sarpanch in 2012. The villages agreed to cooperate with the officials this time, following which officials established six booths in villages Gobindapur, Trilochanpur and Dhinkia under Dhinkia gram panchayat. “The people of Dhinkia have exercised their democratic rights peacefully and fairly after five years. Large numbers of anti- POSCO residents voted to teach the ruling party a lesson,” said Sishir Kumar Mohapatra, secretary of POSCO Pratirodhaka Sangram Samiti (PPSS). The main candidates contesting for the Earasama- Balikuda Assembly seat are Prasant Muduli from the ruling party in the state, Biju Janata Dal, Abhijit Sahoo (son of Abhaya Sahoo, president of PPSS), who is contesting on CPI ticket, and Lalatendu Mohapatra from Congress. Abhaya Sahoo said the large voter turnout means CPI will win the seat. “Villages under Dhinkia gram panchayat witnessed intense peasant protests in the past nine years against farmland acquisition. 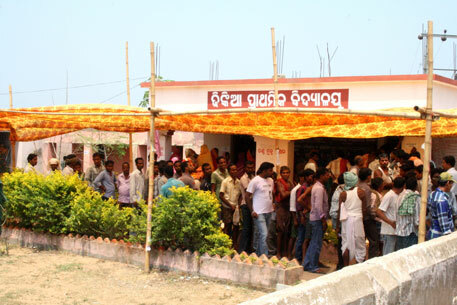 People turned out in large numbers to vote against the ruling party, BJD,” said Manorama Khatua of Gobindapur village. "It was a proxy battle between the pro- and anti- POSCO groups in this election," said Mahadev Jena (65), a betel vine farmer of Dhinkia. “Senior leaders of PPSS are the members of CPI because of which we voted for CPI. Forceful land acquisition by the government for POSCO is a major election plank,” said Basanta Sahoo of Dhinkia village. "I will win the election as our party is spearheading anti-land acquisition movement since more than nine years in these areas," said Sahoo, the CPI candidate. “The fate of at least 25,000 farmers of three gram panchayats of Dhinkia, Gadakujang and Nuagaon is hanging in balance as the government forcefully acquired around 1,093 hectares of land in these areas to hand over to South Korean steel company POSCO because of which large numbers of people voted for me,” said the CPI candidate. Six years back, Narayan Mandal, a septuagenarian of village Gobindapur under Dhinkia gram panchayat, lost his eldest son Tapan alias Dula Mandal. He was killed by pro-POSCO residents on June 20, 2008 in a bomb attack. On March 2, last year, his younger son Tarun was also killed along with two other two anti-POSCO protesters in a bomb blast at Patana village. "In 2004, I could not cast my vote as the authorities had not established polling booths in Dhinkia. But the officials opened polling booth in the nearby village Gobindapur this time. I exercised my voting right to take the revenge for the death of my two sons,” said Mandal (77) . "I voted in favour of the CPI candidate,” he added. Narahari Sahoo (53) of Gobindapur was also killed in the bomb blast last year. His daughter, Jharana (23), is studying to be a chartered accountant at the Institute of Charted Accountancy of India in Bhubaneswar. “I came back from Bhubaneswar to my village on Wednesday night to vote in favour of CPI candidate,” said Jharana. Like Narayan and Jharana, a large number of people voted in favour of the CPI candidate, said Abhaya Sahoo, president of PPSS and father of the CPI candidate for Earasama- Balikuda Assembly segment. “The people of my constituency are supporting industrialisation. Few persons with an ulterior motive have been opposing the proposed steel plant of POSCO in our areas. In this election, large numbers of voters voted in favour of BJD as the state government has already acquired land for the steel project,” claimed Mudali of BJD.